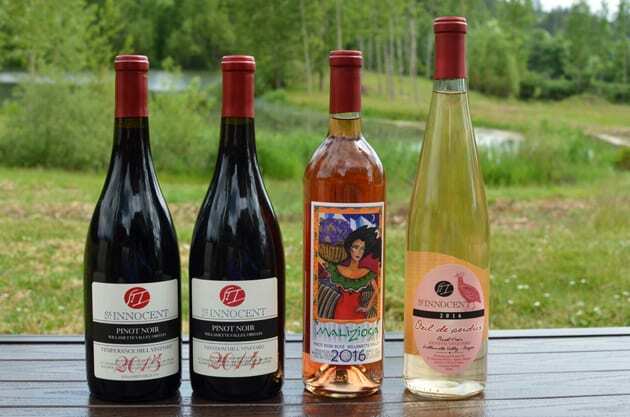 It is hard for me to turn down a wine tasting event so when fellow wine writer Annette Rau Solomon asked me to her home for dinner with Mark Vlossak of St Innocent Winery, I immediately accepted the invitation to discover an Oregon winery. Since that time I have visited the winery. St Innocent Winery just moved their winery to a new location near Salem in Jefferson, Oregon in what I call the heart of the Willamette Valley and Pinot Noir country. 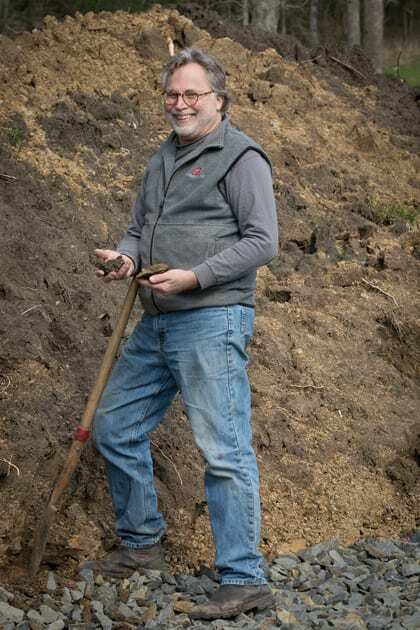 In celebration of St Innocent 30th year creating single vineyard designed Pinot Noir, Mark and his wife Vickianne purchase a 47.5-acre property in the South Salem Hills. Mark plans to plant an Estate vineyard initially with 15 acres of grape vines, 60% Chardonnay, Dijon clone and the remaining acres planted with Pinot noir 777 and Pommard. 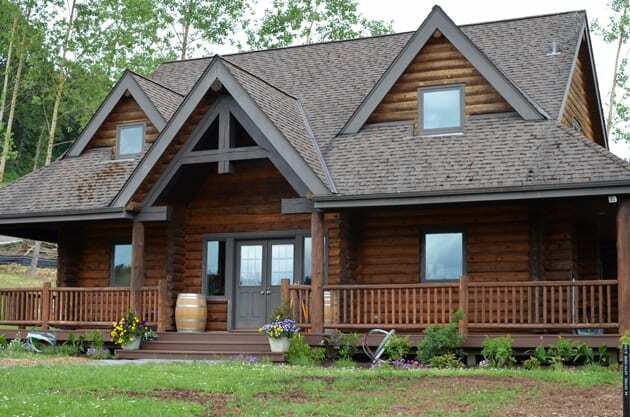 Currently, a log cabin style building acts as their tasting room while their new winery and tasting room are under construction. Mark hopes the new tasting room and winery will open in August just in time for the 2018 harvest. Mark produced his first vintage in 1988. His production in the late 1980s and early 1990s was mostly Chardonnay. Today the focus concentrates predominately on Pinot Noir. Currently, St Innocent purchases grapes from 4 other vineyards, Temperance Hill, Momtazi, Freedom Hill and Shea. 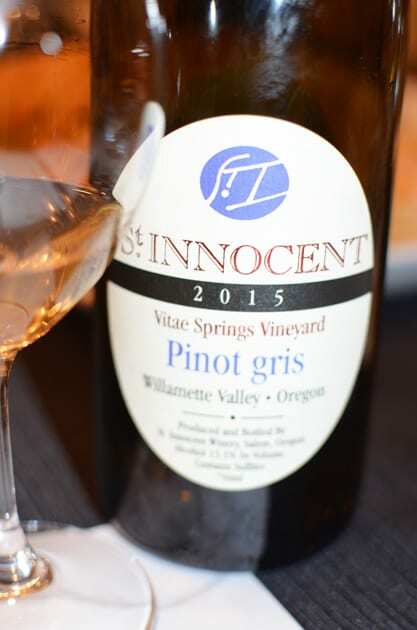 This Oregon winery is named after Mark’s father John Innocent Vlossak, who was a wine educator and importer. Using his father’s middle name pays tribute to the important role his father played in inspiring Mark to pursue winemaking. Mark’s induction into wine began as a child, and his passion grew as he learned more about wine and the winemaking process. For Mark, the grapes tell the story, and in the Willamette Valley, it is the wind coming from the Pacific Ocean in the late afternoon, coming through the Van Duzer Corridor eastward bringing with it the diurnal effects that essentially darken the fruit and enhance the spices. This wind is a part of the tale of the Pinot Noir grape. The essence of the St Innocent Winery philosophy is creating wines to accompany food. These wines complement the cuisine you choose, and as one discovers tasting St Innocent wines, they are not overpowering but very subtle in their demeanor. Mark Vlossak at his newly located Oregon Winery. Dinner included samples of several of the wines Mark creates. We started with the Pinot Blanc, Freedom Hill Vineyard, a wine that presents itself as sweet and savory due to its Alsatian style. The grapes grow in one of the oldest Oregon ocean floor soils. Between the volcanic and ocean floor soils, the character of the wine promotes a nice acidity and minerality. The grapes are picked late, and a small portion barrel ferments while the majority of the grapes are ferment in tanks for eight months. The results deliver a wine with flavors of stone fruits and white flowers with hints of spice of the finish. The Pinot Gris Vitae Springs Vineyard accentuates the ripe fruit in this wine. The wine ferments in the tank for eight months on the lees. Again the fruit is picked late. Villages Cuvée Pinot Noir blends several of St Innocent vineyards located in the northern part of Willamette Valley. The wine comes across and soft and delicate. The Temperance Hill Vineyard is located in the Eola-amity Hills AVA. This vineyard is the coolest of all the St Innocent vineyard sites and located at one of the highest elevations. The Pinot Noir delivers flavors of cherry and berries. 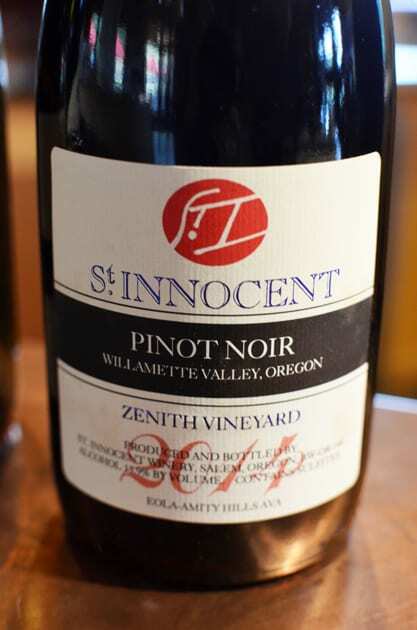 Zenith Pinot Noir represents St Innocent’s estate vineyard Pinot. Blending four clones of Pinot Noir, Pommard, Wadenswil, 115, and 777, the wine exhibits wonderful red berry flavors accented with sweet spice. Next Mark offered a side-by-side comparison of the 2013 and the 2014 Shea Vineyard Pinot Noir. The vineyard is located in the Yamhill-Carlton District AVA. Interestingly, the 2013 was a cool vintage, and the wine expressed dark cherry and licorice aromas and flavors with a deep, dense texture. The 2014 seemed brighter delivering sweet cherry flavors. Finishing our dinner, we sampled the Momtazi Vineyard Pinot Noir and the Freedom Hill Vineyard Pinot Noir. The Momtazi Vineyard is located in the McMinnville AVA. This vineyard is farmed using biodynamics. This wine is probably the most complex and intense of the wines sampled. I found flavors of dark fruit accented with hints of pepper. Freedom Hill Vineyard is located in the foothills of the Coast Range. 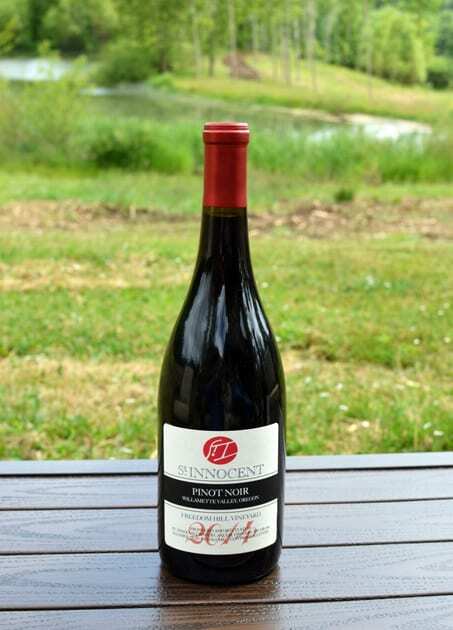 The Pinot Noir results in a rich, structured Pinot Noir with full-body and dark cherry flavors. I recently visited this Oregon winery in its new location. 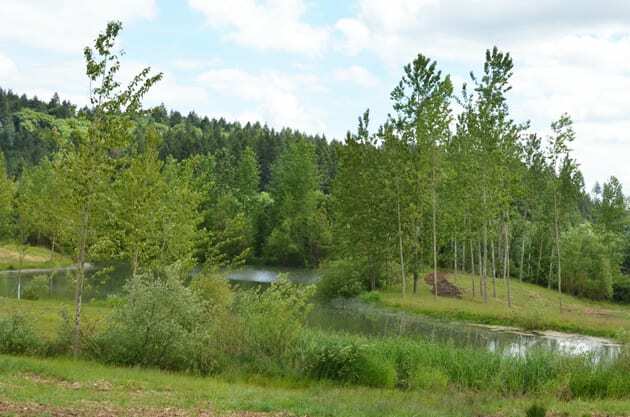 It was fun tasting the wines in their environment and viewing the picturesque tree-lined landscape that also includes a pond. I sampled most of their wines but here are a few of my favorites from this visit. I found a nice acidity and flavors of pear in the 2015 Pinot Blanc. The 2016 Chardonnay was a favorite with it aging in old oak thus producing a wonderful Burgundian style wine. I was particularly fond of two Pinot Noirs, the 2014 Freedom Hill and the 2015 Temperance Hill. Two fun wines I sampled on this occasion were the 2016 Oeil De Perdrix and the 2016 Maliziosa. 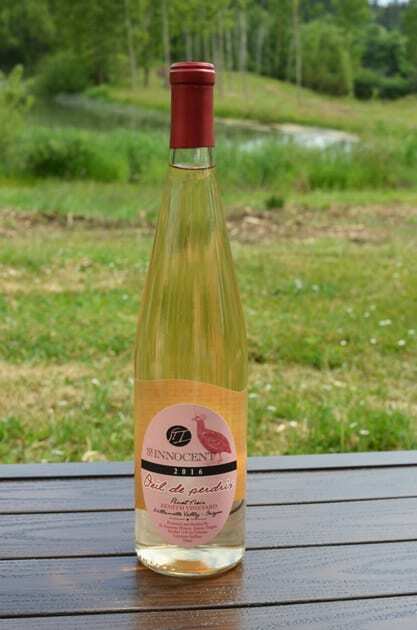 The Oeil De Perdrix is a white Pinot Noir with only 11% alcohol. Oeil de Perdrix means Partridge’s Eyes in French and originally described a pale pink Rosé made in Switzerland. In St Innocent’s version, the grapes are picked early, pressed off their skins and fermented in stainless steel. 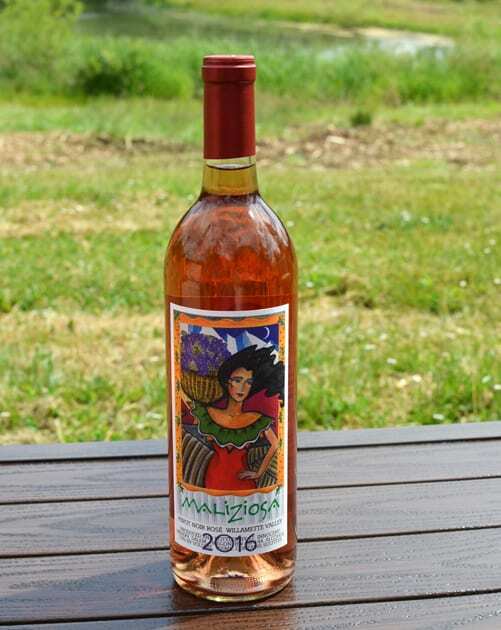 Finally, we tasted the Maliziosa, a Rosé that might describe another facet of Mark’s personality because Maliziosa means not so innocent in Italian. I found a fun and lively Rosé. 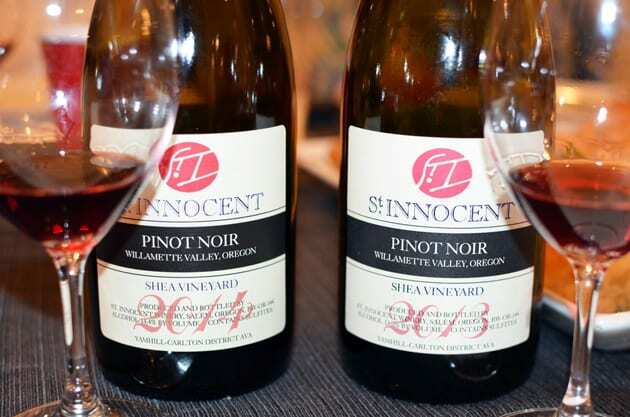 The highlight of visiting this Oregon Winery is that St Innocent produces a wide variety of Pinot Noir that can satisfy almost any Pinotfile’s fancy.